I’m at home enjoying the time with my family which as you have seen has just grown with a new member 🙂 Cisco Live US was just held in San Diego and now the sessions have been uploaded. They used to cost money but now they are free! It’s a too good resource to not use it. It has sessions for routing&switching, NMS, voice, video, service provider and basically everything you can think of. It even has CCIE sessions with advice and what to expect at the lab. Go to www.ciscolive365.com and create an account and you will have access. You will also have access to earlier events. As you’ve noticed I’ve been studying SSM and what better way to learn than to blog about it. I recently got a Safari subscription which has been great so far. I’ve been reading some in the book Interdomain Multicast Routing: Practical Juniper Networks and Cisco Systems Solutions which has been great so far. We are still using the same topology and now we will look a bit more in detail what is happening. R1 will be the source, sending traffic from its loopback. R3 will be the client running IGMPv3 on its upstream interface to R2. As explained in previous post I am doing this to simulate an end host otherwise I would configure it on R3 downstream interface and then it would sen a PIM Join upstream. To run SSM we need IGMPv3 or use some form of mapping as described in previous post. It is important to note though that IGMPv3 is not specific for SSM. With SSM a (S,G) pair is described as a channel. Instead of join/leave it is now called subscribe and unsubscribe. So the first thing that happens is that the client (computer or STB) sends IGMPv3 membership report to the destination IP 224.0.0.22. This is the IP used for IGMPv3. This is how the packet looks in Wireshark. The destination IP is 224.0.0.22 which corresponds to the multicast MAC 01-00-5E-00-00-16. 16 in hex is 22 in decimal. We clearly see that it is version 3 and the type is Membership Report 0x22. Number of group records show how many groups are being joined. Then the actual group record is shown (225.0.0.1) and the type is Allow New Sources. The number of sources is 1. And then we see the channel (S,G) that is joined. Then R2 sends a PIM Join towards the source. We can see that it is a (S,G) join. The SPT is built. R2 will send general IGMPv3 queries to see if there are still any receivers connected to the LAN segment. The query is sent to all multicast hosts (224.0.0.1) and if still receiving the multicast the host will reply with a report. The type is Membership Query (0x11). The Max Response Time is 10 seconds which is the time that the host has to reply within. We can see in this report that the record type is Mode is include (1) compared to Allow New Sources when the first report was sent. Now R3 unsubscribes to the channel and the IGMP report is used once again. The type is now Block Old Sources (6). After this has been sent the IGMP querier (router) has to make sure that there are no other subscribers to the channel so it sends out a channel specific query. If noone responds to this the router will send a PIM Prune upstream as can be seen here. Finally. How can we see which router is the IGMP querier? Use the show ip igmp interface command. We can see some interesting things here. We can see which router is the designated router and IGMP querier. By default the IGMP querier is the router with the lowest IP and the DR is the one with highest IP. DR can be affected by chancing the DR priority. We can also see which timers are used for query interval and max response time among other timers. So by now you should have a good grasp of SSM. It does not have a lot of moving parts which is nice. This is a followup post to the first one on SSM. The topology is still the same. So why would we use SSM mapping in the first place? IGMPv3 is not supported everywhere yet. Maybe the Set Top Box (STB) is not supporting IGMPv3 but your ISP wants to support SSM. Then some transition mechanism must be used. There are a few options available like IGMPv3 lite, URD and SSM mapping. IGMPv3 lite is daemon running on the host supporting a subset of IGMPv3 until proper IGMPv3 has been implemented. With URD a router intercepts the URL requests from the user and the router joins the multicast stream to the correct source even though the user is not sending IGMPv3 reports. This requires that the multicast group and source is coded into the web page with links to the multicast streams. SSM mapping takes IGMPv2 reports and convert them to IGMPv3. We can either use a DNS server and query it for sources or use static mappings as I will explain here. Static mapping is done on the Last Hop Router (LHR) and it is fairly simple. This is how we configure it. The config is pretty self explanatory. First we create an access-list that defines the groups to be used for SSM mapping. Then we enable SSM mapping. Then we tie together the ACL with the sources that are allowed to send to those groups. Now we need to verify the mapping. First we take a look at R2 with show ip igmp ssm-mapping. Looks good so far. We will use R3 to simulate a client joining to 225.0.0.100 via IGMPv2. We will debug IGMP to see the report coming in. R3 will join the group via the igmp join-group command. One thing is important to note here. Usually we configure ip igmp-join group on downstream interface to simulate LAN segment and then PIM Join is sent upstream. In this case we want only IGMP join to be sent so therefore we configure the igmp join-group on the upstream interface. Also no PIM should be enabled. 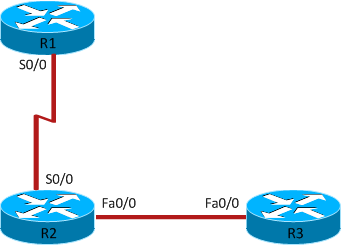 This makes the router act as a pure host and not do any multicast routing. What would happen otherwise is that the router will have RPF failures when the source is sending traffic because for traffic not in SSM mode a RPF lookup is done against the RP. Since no RP is configured the RPF would fail, as a workaround we can configure a static RP even though it isn’t really used it would make the RPF check pass. This is the debug output from R3. We can clearly see that IGMPv2 report was sent. Now we go to R2 to see if it is converting the IGMPv2 join to IGMPv3. It is clear that the conversion is taking place. We look in the MRIB as well. We see that we now have (S,G) joins in R2! As a final step we will also verify in R1. Now the ping should be successful. So the important thing here is to make R3 act as a pure host otherwise it will not work. This is a bit overkill for verification but I just wanted to show how it could be done. I’m planning to do a post on BPDUs sent by Cisco switches and analyze why they are sent. To fully understand the coming post first we need to understand the different versions of Ethernet. There is more than one version? Yes, there is although mainly one is used for all communication. Most people will know that Robert Metcalfe was one of the inventors of Ethernet. Robert was working for Xerox back then. Digital, Intel and Xerox worked together on standardizing Ethernet. This is why it is often referred to as a DIX frame. The DIX version 1 standard was published in 1980 and the version used today is version 2. This is why we refer to Ethernet II or Ethernet version 2. The DIX version is the frame type that is most often used. Access Method and Physical Layer Specifications”. So here we see the term CSMA/CD for the first time. I’m not here to give you a history lesson but instead explain the frame types and briefly discuss the fields in them. We start with the DIX frame or Ethernet II frame. This is the frame that is most commonly used today. It looks like this. The preamble is a pattern of alternating ones and zeroes and ending with two ones. When this pattern is received it is known that anything that comes after this pattern is the actual frame. The source and destination MAC is used for switching based on the MAC. After that follow the actual payload which should be between 46 – 1500 bytes in size. In the end there is a Frame Checking Sequence (FCS) which is used to check the validity of the frame. If the CRC check fails the frame is dropped. In total the frame will be maximum 1514 bytes or 1518 if counting the FCS. When it comes to 802.3 Ethernet there are actually two frame formats. One is 802.3 with 802.2 LLC SAP header. It looks like this. This was the original version from the IEEE. Many of the fields are the same. Let’s look at those that are not. The preamble is now divided in preamble and Start Frame Delimiter (SFD) but the function is the same. The length field is used to indicate how many bytes of data are following this field before the FCS. It can also be used to distinguish between DIX frame and 802.3 frame as for DIX the values in this field will be higher e.g. 0x806 for ARP. If this value is greater than 1536 (0x600 Hex) then it is a DIX frame and the value is an Ethertype value. Then we have some interesting values called DSAP, SSAP and Control. SAP stands for Service Access Point, the S and D in SSAP and DSAP stands for source and destination. They have a similar function as the Ethertype. The SAP is used to distinguish between different data exchanges on the same station. The SSAP indicates from which service the LLC data unit was sent and the DSAP indicates the service to which the LLC data unit is being sent. IP has a SAP of 6 and 802.1D (STP) has a SAP of 42. It would be very strange to have a different SSAP and DSAP so these values should be the same. IP to IP would be SSAP of 06 and DSAP of 06. One bit (LSB) in the DSAP is used to indicate if it is a group address or an individual address. If it is set to zero it refers to an individual address going to a Local SAP (LSAP). One bit in the SSAP (LSB) indicates if it is a command or response packet. That leaves us with 128 possible different SAPs for SSAP and DSAP. The contol field is used to select if communication should be connection-less or connection-oriented. Usually error recovery and flow control are performed by higher level services such as TCP. The IEEE had problems to address all the layer 3 processes due to the short DSAP and SSAP fields in the header. This is why they introduced a new frame format called Subnetwork Access Protocol (SNAP). Basically this header is using the type field found in the DIX header. If the SSAP and DSAP is set to 0xAA and the Control field is set to 0x03 then SNAP encapsulation will follow. SNAP has a five byte extension to the standard 802.2 LLC header and it consists of a 3 byte OUI and a two byte Type field. From a vendor perspective this is good because then they can have an OUI and then create their own types to use. If we look at PVST+ BPDUs from a Cisco device we will see that they are SNAP encapsulated where the organization code is Cisco (0x00000c) and the PID is PVSTP+ (0x010b). CDP is also using SNAP and it has a PID of CDP (0x0200). I will talk more about BPDUs and STP in a following post but first I wanted to provide the background on the Ethernet frame types used. In summary there are three different Ethernet frame types used. DIX frame, also called Ethernet II, IEEE 802.3 with LLC and IEEE 802.3 with SNAP encapsulation. There are others out there as well but these are the three major ones and the DIX one is by far the most common one.